Box Dimensions (LxWxH) 19.2 x 11.0 x 8.8"
EOS RP Mirrorless Digital Camera with 24-105mm Lens is rated 4.6 out of 5 by 44. Rated 5 out of 5 by HDK from The price was right Coming from the owner of a 6D, this was a subtle upgrade. I am not a professional but have done a few shoots for family and friends. I bought this camera primarily for the autofocus features. The eye tracking has already come in handy while trying to take pictures of my kids. I like the size. It’s similar to the average crop sensor. The grip attachment made it feel a lot more comfortable for my big hands. The camera feels solid and of high quality. Battery life is fine, still shows full charge after around 70 shots. I have yet to stress test the battery so I can’t speak on overall life. So far so good. Overall I am happy with my purchase. Rated 5 out of 5 by Arman from Amazing Camera The RP is a beast when it comes to pictures! I compared it to my 5D3, files are far more superior on the RP. Focus is crazy fast on my L lenses and extremely accurate. Perfect backup camera for my wedding photography. Also, Files are much more cleaner than my 6D2, I will be selling that camera. B&H processed my order and shipped it the same day! Excellent customer service. Highly recommend if you can’t afford the R.
Rated 5 out of 5 by Dave from Slow to Upgrade I was a generalist photog back in the day shooting 4x5, medium, and 35. I switched from Nikon to Canon with the 5D, which I upgraded to the 6D when it came out. The RP is the first body upgrade since, I did it for the value, compact size, better autofocus, better IQ, and last but not least to put my CLE Rokkor Ms (28, 40, 90) on a full frame digital body that did not cost an arm and a leg. Picked up an adapter for a song, and I am a happy camper. Ill continue to use my EF lenses for anything resembling a job, but for personal work Im more apt to use the Rokkors. Rated 5 out of 5 by Casper from Fantastic Camera Looks like I’m the first review for someone who’s actually used this camera. The prior reviews are all from people complaining about nonsense who haven’t even used it. I just got this camera today and it’s absolutely fantastic. The first thing that blew me away is how small it is. I’m using this for travel, kids, and hobby. Having a small camera has always been unattainable when I have DSLR image expectations. This is my first mirrorless and I’m super impressed. The pre-order promo included the EF adapter and the extension grip. The EF adapter is essential as I’m bringing over some EF L lenses that I’ve collected over the years. Today I have been shooting with my 24-70 and the quality is fantastic. Auto focus is fast as heck and I don’t have a single negative to say about the adapter. I’m waiting for my first RF lens to ship and I’m excited to see how well that works out. I put the extension grip on and found that it really wasn’t necessary, even with the 24-70 L which is pretty big. I ended up taking it off because I like holding the smaller camera better. I’m 6’2” so it’s not like I have tiny hands. Perhaps I will put it on when I’m using my 70-200 and I’ve got some real heavy length on the camera. But as far as it goes now, I don’t think it’s absolutely necessary to make the camera bigger for what I’m using it for. The viewfinder display is great. This is my first electronic view finder and it’s still fun looking through it compared with a DSLR optical viewfinder. The primary display is sharp, bright, and familiar to my older Canon cameras. I was really torn on purchasing this camera or the R. I’m glad I waited and held out for this one. With the money saved I’m half way towards one of the new RF L lenses. I’m also a big fan of the small size (if you can’t already tell). Rated 5 out of 5 by Susana from My first full frame - what a camera! I just love the EOS RP. Bought it as an upgrade from my 77D because i wanted to go full frame. The focus is super fast, EVF is amazing, the image quality is outstanding, and the 24-105 RF lens is very very sharp. The images i get from this camera at iso 12800 are just unbelivable. Rated 4 out of 5 by George from A Lot of Camera for the Money Im an enthusiast level photographer and am heavily invested in Canon photography equipment, mostly purchased from B&H. I had been looking for a kit that I could comfortably carry with me everywhere that offered very good image quality without lugging around a heavy body and lens. I found it in the Canon EOS RP with the RF 24-105mm f/4 IS USM lens. This is much more than a camera for beginners, or those upgrading to full frame. Its lightweight and compact, yet very comfortable in the hand. The perfect size for everyday use, travel, street, etc. The build is typical Canon quality and very user friendly. Image quality is excellent, just what you would expect from a camera with a full frame sensor. For the money you get a quality mirrorless Canon body with a full frame sensor, the lens adapter so you can use all of your EF and EF-S lenses, and the grip extender. Take it from an experienced Canon user, this is a real bargain! My only gripe is the battery life so I would highly recommend you purchase at least one additional battery if purchasing the RP. 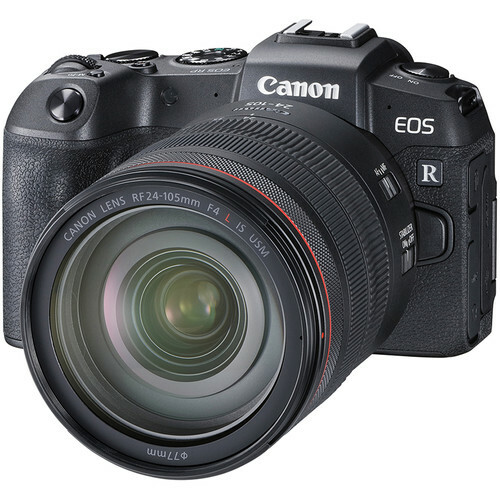 The RP is exactly what Canon designed it to be, a user friendly value priced full frame mirrorless camera offering decent build quality and excellent image quality. Rated 5 out of 5 by Jacob from Great Addition Pre-ordered this camera on launch day. Received on February 28. So far this camera has met my expectations. I dont really care about the video capabilities, my priorities are all around photography. The camera is light and has all the functionality I need for family, event and landscape photography. Its essentially a EOS 6D Mark II with enhnaced processor and what Ive experienced so far equal to or better image quality. Can I hold the camera up to my eye for composing in still photography mode? Yes, the Canon EOS RP does have a built-in Viewfinder and LCD screen, so you can use the viewfinder for photography and the LCD screen for video. Does Canon RP have an external microphone port for video? The EOS RP lets external microphones to be connected via its 3.5mm jack. There&rsquo;s a headphone jack for monitoring audio as well. Is it good for landscape photography? Yes it is. This will be a fantastic camera for landscape photography. Is it capable of recording to an external device? The EOS RP can shoot 4K at 24/25fps at 120Mb/s and with 8-bit 4:2:2 color depth for both internal recording and with an external recorder. Is there a crop factor in the image when using Canon Mount adapter EF-EOS R with Canon EOS RP model...? Yes, the camera will crop the sensor automatically if you attach an EF-S lens to the adapter. This is actually a good thing. Otherwise, you would have dark corners of every photo (heavy vignette) as the image coming from an EF-S lens is literally smaller than the full frame sensor. Does it have 24 FPS HD? it does have 25fps but in pal. Is there a crop when shooting 4K video? Yes, it crops to a 1.6 APS-C size. You can use EF-S lenses like the Canon 10-22mm to regain a wide view. When used with adapters such as the Canon Mount Adapter EF-EOS R, the sensor is automatically cropped. Does it support clean video out via hdmi or some other standard port which would allow full quality externalizations recording?